In late 1941, after signing off on construction of the original Jeep vehicles, the US government threw out a new challenge to manufacturers. 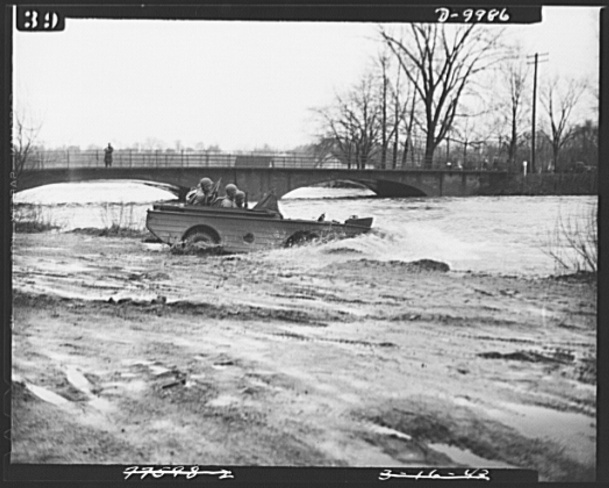 That challenge was to design an amphibious version of the same truck called the GPA (General Purpose Amphibious). 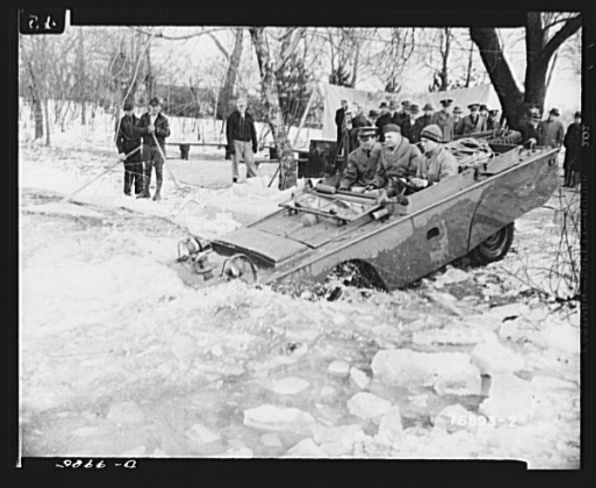 As the European theater of war got more and more involved, transportation and movement became harder, so military planners thought an amphibious Jeep would do the trick to keep soldiers moving when the roads went from bad to liquid. Two companies tried to meet the challenge of creating a 2700lb version of the Jeep that could float and navigate both inland waterways and the ocean surf. Ford and Marmon-Herrington took up the idea with gusto. Both companies were provided the basic design of the hull which had been conceived by the same people who developed the hull for the famous and successful DUKW 6×6 amphibious trucks. Due to that fact, it should not be a surprise that the design appears to our non-searfaring eyes to be a scaled down version of the DUKW. You may not know the name Marmon-Herrington, but you should. They have been around since the early 1930s and have always specialized in all wheel drive and four wheel drive vehicles. Ever see those big telephone company trucks with four wheel drive and huge front axles under them? Most likely they are Marmom-Herrington conversions. 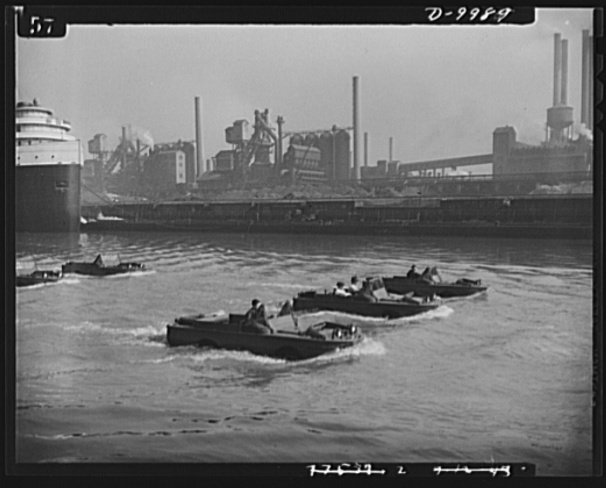 They have built everything from tanks to buses during their life and continue to operate as an American company in Louisville, Kentucky today. Believe it or not, Warren Buffet’s operation actually owns a controlling stake in MH. Due to Marmom-Herrington’s history and normal project menu, their Jeep was built like a tank…literally. They used heavy steel plate to build the hull which also doubled as the chassis. This was a very strong design but was also porky as hell. That weight would later prove to be too much of a burden to over come and Ford’s design was awarded the contract. What Ford did differently was to use sheet metal to build the hull and then use the existing chassis of the Jeep to build the rest of the vehicle off of. While that sounds a lot lighter, and it was in comparison to the Marmon-Herrington example, the GPA (General Purpose Amphibious) was still tipping the scales at 3,500lbs. 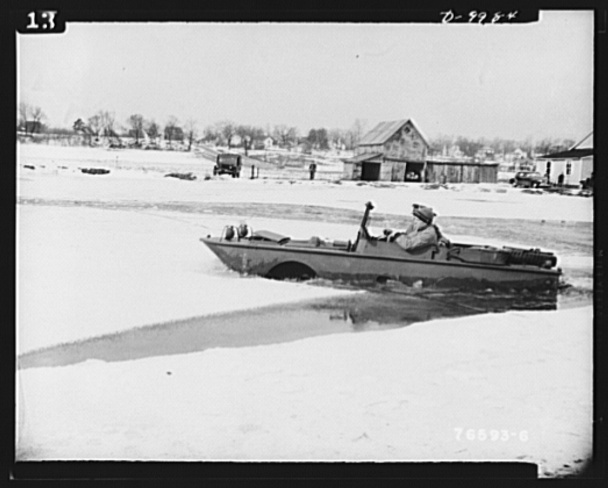 The M-H version weighed more than 4,000lbs and it was all being lugged around by that little 60hp Go Devil engine! Ford also had the added advantage of already being in production on the GPW, so it could raid the parts bin and produce the vehicle cheaper than M-H would have ever been able to. 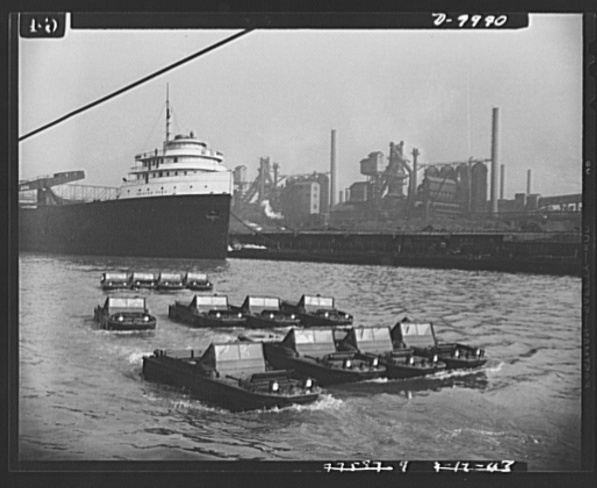 After being awarded the contract in 1942, Ford set to testing and finalizing the vehicle before it went into production. 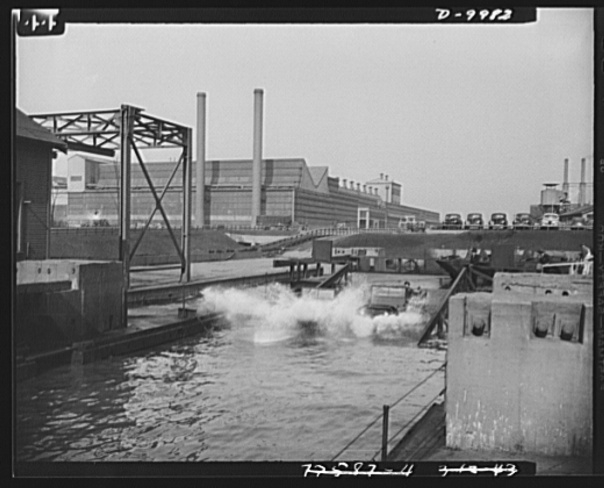 We found an amazing collection of photos documenting the testing process of these vehicles in and around Ford’s River Rouge production plant in Dearborn, Michigan. As you will see below, these little “Seeps” (Sea Jeeps) were put through their paces in the cold conditions of a Michigan winter. Unfortunately, as you’ll find out next, testing in the Detroit area proved to be completely inconsequential when it came to the performance of the GPAs in the field. The flaws of the GPA showed themselves very early on in the production run and even during testing. While Ford’s vehicle was hundreds of pounds over the government’s requested spec, the basicl hull design was not altered at all. 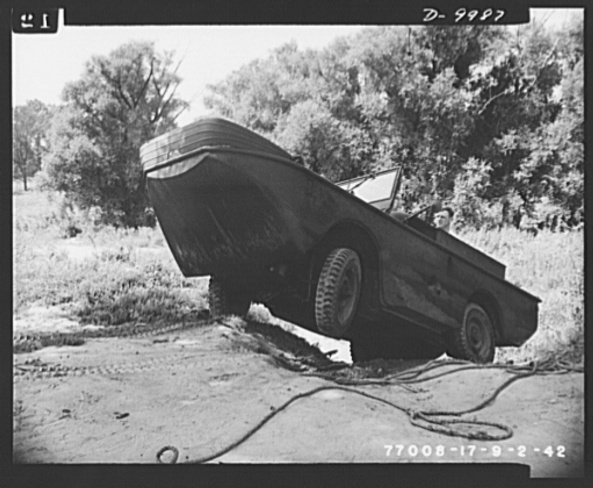 A heavier vehicle with the same sized hull meant that the Sea Jeep sat far lower in the water than anyone had really planned on. 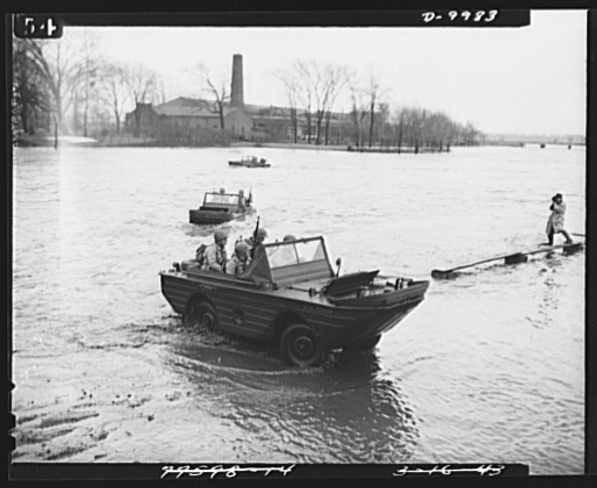 When a load of soliders and their gear was added, the little vehicle was fighting to keep its head above water and was certainly not capable of traversing water in anything more than tiny swells. A legitimate wave could have easily swamped the small craft. In fact, reading the history of these vehicles, soldiers had no love for them because they sank at a scary rate when trying to deliver poeple and goods onto land in the heat of battle. On land, the story was not much better. Where the normal GPW Jeep was nimble, small and manuverable, the GPA was fat and wide and slow. Three more attributes that soldiers really did not like when the going go rough, which it frequently did in the European theater when roads and bridges were destroyed. We actually read one account where multiple GPAs were stuck in a shallow river while normal Jeeps drove right past them, most likely full of GIs yelling lots of obscene junk at the dudes in the Sea Jeeps. 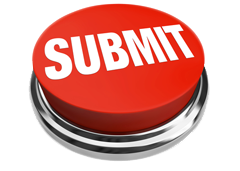 After a one year run of about 12,000 vehicles, the GPA line was stopped, never to be started again. 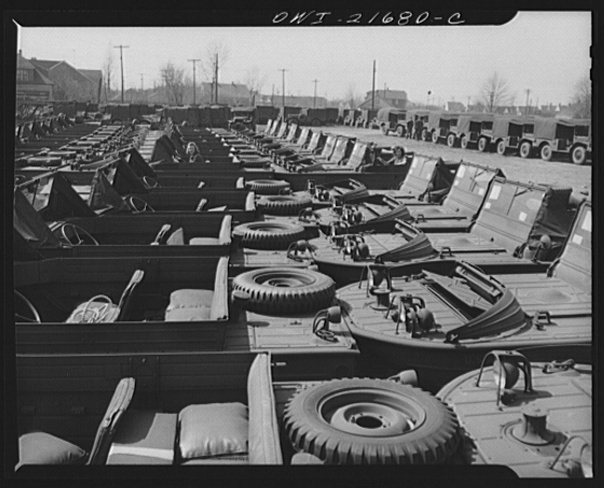 Interestingly, most of the remaining inventory and those Sea Jeeps that didn’t head to Davy Jones’ Locker or get fragged by their own users got shipped to Russia as part of the Lend-Lease program. Not suprisingly, the Russians took to the strange little Jeeps and continued to use and develop them for years after the war. There are a few of them kicking around that have been restored. After you scroll through all the totally killer old defense department photos, there’s a video of one cruising on a lake during an military vehicle show a couple years back. WWII was a breeding ground for new ideas and mechanical innovation. Like all things, not every idea was a winner and some lessons were learned the hard way. One of those lessons was the GPA, the long lost Ford Sea Jeep. 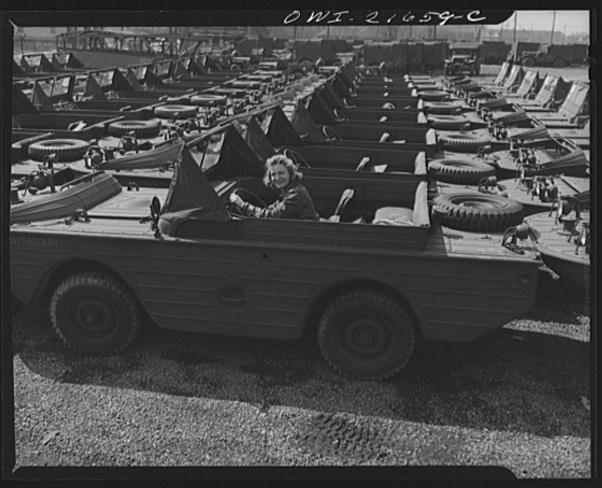 Scroll down to see a collection of truly bitchin’ defense department photos from the early 1940s showing the Sea Jeeps in testing! Those Vintage Training Films? 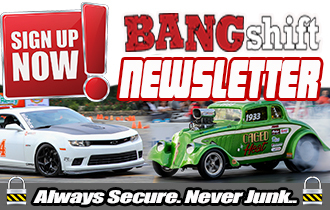 They All Came From One Guy, and His Story is Awesome BANGshift LIVE Drag Racing Double Header Weekend! 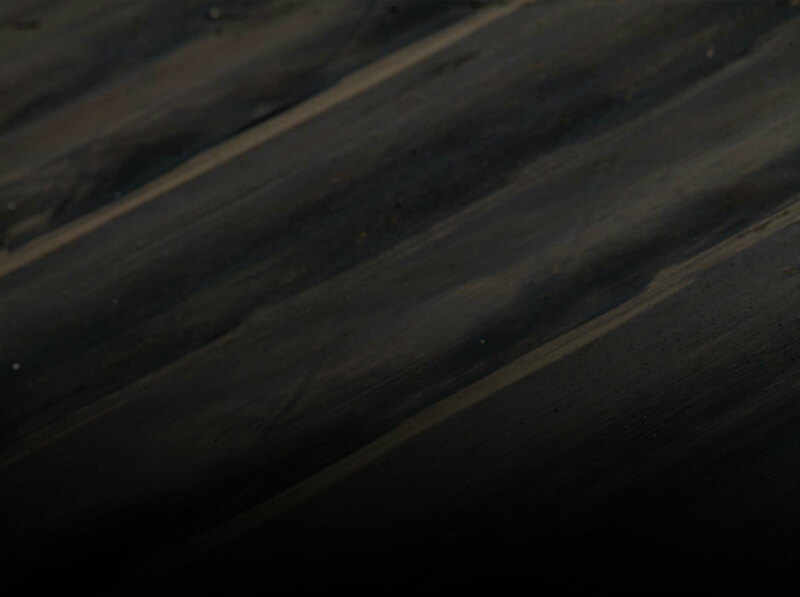 Pro Mods In Texas And Bracket Racing In Arizona! Even during wartime the gov’t could produce a “well polished turd” ! !